I have never owned a 1911 before, so I figure now is a good time to get started. Without knowing much about the single-action behemoth that has proven itself over the last century, I purchased my Taurus PT1911 back in January. I was in El Paso, Texas on assignment and paid the humble sum of $650.00 dollars. What initially impressed me was the feel. 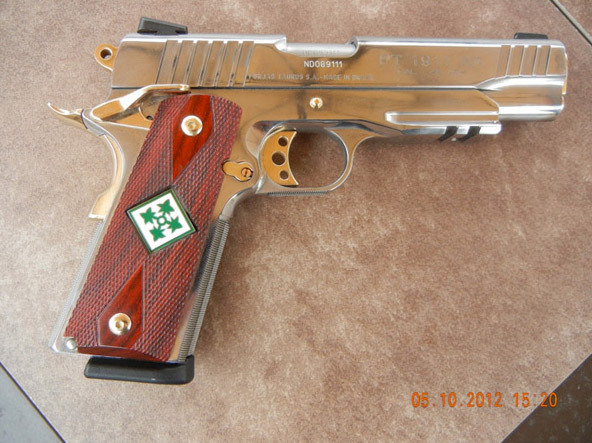 When you hold this Taurus PT1911, it feels like a GUN. Not some cheap knockoff. all the features you would want on a single action handgun are present. The standard grip safety on the back, ambidextrous safety (preventing trigger squeeze and the slide from moving), and security system on the top of the hammer. The security system simply takes a special key that comes with the gun and completely locks it from use. I have never been a big fan of the ambidextrous safety as I am a left handed shooter. It doesn’t quite get in the way but at the same time I think it detracts from the look of the gun. There have been reports of this safety breaking, but after well over 700 rounds through this bad boy, I have yet to see any sign of wear and tear. The range report for this handgun is extremely exciting. I was getting twenty-five yard shots one handed landing on a human sized metal target with little to no effort. It seemed as if this gun wanted to land where I aimed it. That either means I am a better shot than I think I am, and/or the gun is just plain awesome. The trigger on my PT1911 was crisp enough. It had little lead before you felt the need to pull the trigger a little harder. (When I say little, I mean about 2 millimeters before you felt you really had to pull the trigger) It is not by any means one of those “mile long” triggers. The gun is well balanced and features a Heine front sight and a rear Novak. While the model I have does not have glow in the dark (tritium) sights, I feel that the small rail beneath the barrel will provide a solution to this. You can attach lights, lasers, or if you wanted to attempt long range pistol shooting a bipod for increased stability. While I am on the topic, these sights are not adjustable but that does not get in the way of shooting. They are easy to use and you simply aim below where you wish to hit. Once I got the hang of this firearm, I was well on my way and wrecking steel at 20 yards with no problem. Thinking I was near invincible with this gun, I started to get cocky and shot from about 35 yards. I did manage to hit the target four out of the eight times, … One-Handed... South Paw of course. I love when handguns come with more than one magazine. It saves me money and the time of tracking down another from the manufacturer or third party that actually works properly. Two magazines (each with a capacity of 8 rounds) came standard with this handgun. So in effect, we have the 8 + 1 deal going on. My only concern with their magazines is that while they work, one magazine seems to cause a jam on the feed ramp to the chamber. While this doesn’t always happen, it shouldn't happen at all. It is frustrating when trying to fire one-handed, reload in the back pocket, only to find out I have a jam. The other magazine however does not bind and the gun functions flawlessly. Perhaps just a bad magazine which I will most likely send back to Taurus. This minor issue will not detract me from such a good looking and functional 1911. As with any 1911, possibilities for customization are endless. To remind me of my military career from 2004-2009, I commissioned a set of grips (with two major division emblems that I served in) placed inside my grips. I really enjoyed my time in the United States Army and wanted something to commemorate my service. As far as failures go, other than one faulty magazine, I have none to report. This gun functions flawlessly! The Taurus PT1911 has excellent recoil management combined with outstanding shot placement and little to no problems mechanically. Not only does this firearm perform well, it wears a price tag we can all agree on. The MSRP based on the Taurus website is set to a reasonably high $900.00 dollars. I've seen this firearm in several shops since I bought mine, none of which price it above $700. I paid $650 for mine and can't praise it enough. The outstanding feel of the gun, the legendary .45 ACP performance, two magazines, and customizability of a 1911. You just cannot go wrong. For those looking for a new 1911, I highly recommend at least trying this one out. For those that are new to the handgun market, new to the .45 ACP, or new to 1911’s in general, the Taurus PT1911 is a good step in the right direction. 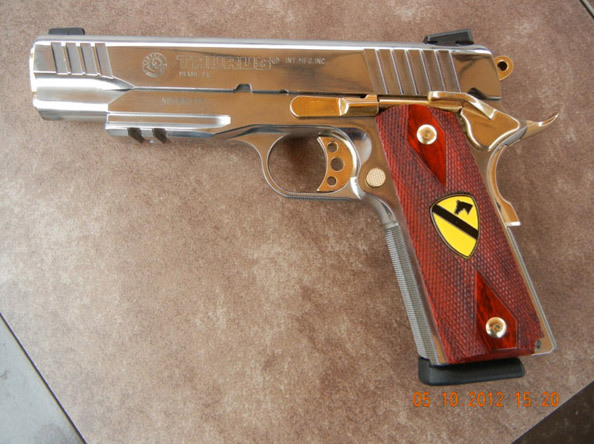 what are your thoughts on the pt1911?